90 lenses per box @ $71.26 per box. Minimum order 2 boxes. 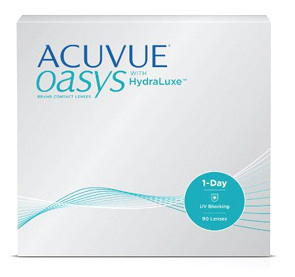 Johnson & Johnson's new Acuvue Oasys 1-Day with HydraLuxe has been designed to help prevent tired eyes - often a symptom of demanding days staring at screens, long periods in an air-conditioned environment, walking or cycling on a hot or dry day, or simply long days of work, exercise and play. The lens' HydraLuxe Technology has a tear-infused design with an enhanced network of tear-like molecules that integrates with your own tear film to help reduce symptoms of tired eyes and dryness.